The Financial Services Legislation Amendment Bill (Bill) passed its third reading today. Now it will be sent on for the Royal Assent, before becoming law. We will include a link to the Act as passed once available here. Our discussions on the earlier versions of the Bill can be found here and here. The Bill is intended to establish a new regulatory regime around financial advice and advisers, so all businesses involved in the provision of financial advice, financial services or financial products will need to examine their operations and assess how they will be affected. Some of the Bill’s provisions will come into force on the day following the Royal Assent, but most will follow later by Order in Council. Any provisions that remain after that will come into force on 1 May 2021. Operating alongside this new legislation will be the Code of Professional Conduct for Financial Advice Services (Code), providing for minimum standards of professional conduct when regulated financial advice is given to retail investors, and regulations on various matters (Regulations). 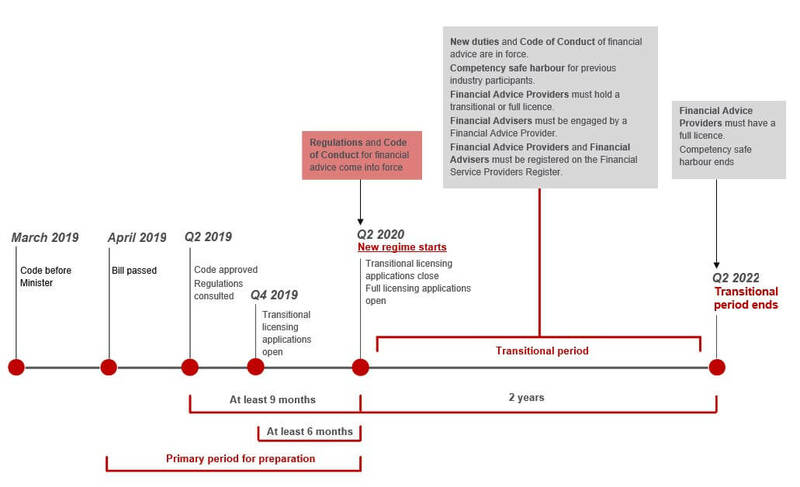 The draft Code is awaiting Ministerial approval, which is now able to progress as the Bill has been passed, while the Regulations are expected to go into consultation this quarter. The submitted version of the Code is not yet available, but its previous draft and Working Group updates are available here, and our discussion of that draft, including the related consultation paper, can be found here. The deployment of the wider regime is expected to follow the timeline below. It will not formally begin until the Code and Regulations come into force, at least nine months after they are approved. Following that, there will be a two-year transitional period to allow those affected to make the necessary changes to their operations. If you have any questions in relation to the incoming regime, or are considering how these changes may affect your business, please contact one of our experts.